LONDON, April 5, 2019 /PRNewswire/ -- Hertz Europe, part of Hertz Global Holdings, Inc. (NYSE:HTZ), has launched The British Collection in the UK, offering a new high-end customer service experience, with a package of Best-of-British services and products – and a personalized welcome service. The British Collection is designed to offer an end-to-end premium service, bringing together The Best of British with a host of extras included – to pamper customers and smooth the journey. Models available for hire include the Land Rover Discovery Sport and the Jaguar F Pace, E Pace, XE and XF, from the Hertz locations at London Heathrow Airport, Marble Arch, and Edinburgh Airport – with free additional driver, and unlimited mileage included in the rates. For added convenience, airport terminal delivery and collection is also part of the package for Heathrow and Edinburgh rentals – and local pick up and drop off for Marble Arch. The three locations will offer a "dedicated lounge" for a premium experience. 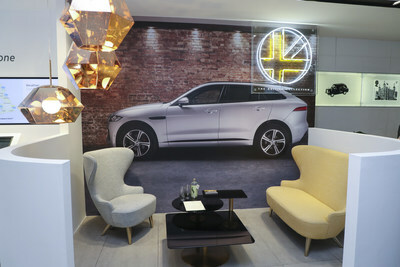 As part of the new collection, customers can relax in a dedicated lounge featuring "Best of British" furnishings from the interior design company, Tom Dixon, and enjoy a refreshing 'botanical' drink from Seedlip, the world's first non-alcoholic spirits brand: an ideal choice for nominated drivers and passengers alike. Hertz has also commissioned premier London Florist, McQueens, to curate a unique in-lounge garden experience, featuring a selection of plants and flowers from across the UK, to recreate the feel of a classic British country garden. To complete the experience, Hertz worked with British artist Lauren Baker to develop a new neon light installation to launch The British Collection, signifying the union of modern and premium brands from the UK. The unveiling of The British Collection follows the successful launch of the premium "Selezione Italia" range in Italy last year. Richard Davies, Country Manager for Hertz UK, says: "The unveiling of The British Collection and dedicated lounges represents Hertz's continuing commitment to providing its customers with unique and exclusive tailored experiences. The British Collection is a new, upmarket offering, built with creativity and luxury in mind. Working with premium British brands and talent, we've been able to build an adventure from branch to the road." Customers choosing The British Collection will benefit from a make-and-model guarantee, meaning that the car booked is the one they drive away with. Customers will further benefit from the option of adding another driver to their booking and arranging local delivery and collection without any additional cost. Bookings for The British Collection must be made directly on Hertz.com, where customers will benefit from Hertz's best rate guarantee. Drivers must be aged 25 or above and present two credit cards. Further details, terms and conditions are available at hertz.co.uk/britishcollection. All Gold Plus Rewards customers are entitled to Hertz Connect with a minimum spend of UK£ 250 (approximately US$ 329). Hertz Connect is a portable, hotspot device providing complimentary 4G Internet connection, free International calls of up to 30 minutes a day, translation tool, and city guides. The Gold Plus Rewards program is free to join, and allows members to earn rewards, enjoy special member discounts, and bypass counters at more than 50 of the world's busiest airports. The Hertz Corporation, a subsidiary of Hertz Global Holdings, Inc., operates the Hertz, Dollar, Thrifty and Firefly vehicle rental brands in approximately 10,200 corporate and franchise locations throughout North America, Europe, The Caribbean, Latin America, Africa, the Middle East, Asia, Australia and New Zealand. The Hertz Corporation is one of the largest worldwide rental companies, and the Hertz brand is one of the most recognized in the world. Product and service initiatives such as Hertz Gold Plus Rewards, Ultimate Choice, Carfirmations, Mobile Wi-Fi and unique vehicles offered through the Adrenaline, Dream, Green and Prestige Collections set Hertz apart from the competition. Additionally, The Hertz Corporation owns the vehicle leasing and fleet management leader Donlen, operates the Hertz 24/7 car sharing business in international markets, and sells vehicles through Hertz Car Sales. For more information about The Hertz Corporation, visit: www.hertz.com.